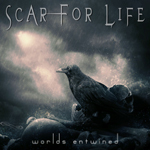 While Scar For Life has been reviewed on Dangerdog Music Reviews, by other reviewers, this is my first time to consider the band. 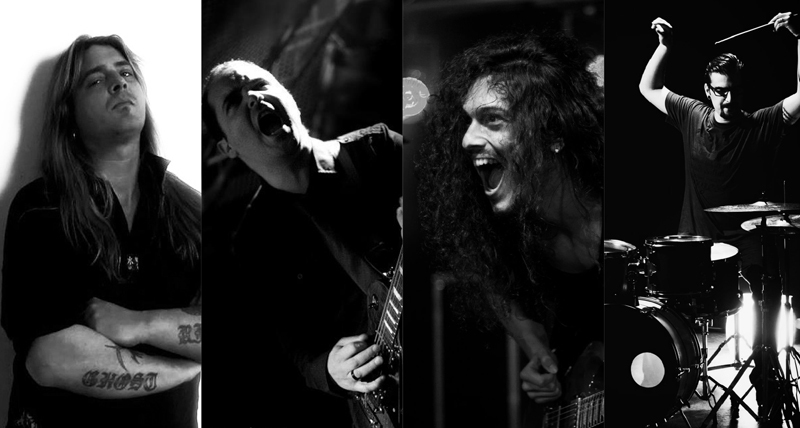 From Lisbon, the band revolves around founder and guitarist Alexandre Santos, who has worked with bevy of different musicians over the last six years or so. Worlds Entwined is the latest and features new vocalist Rob Mancini (Hotwire, Crush) who also supplies the lyrics, and includes guest appearances by drummer Vinnie Appice and guitarist Neil Fraser (Ten, Rage of Angels). Scar For Life: in tetraptych. As suggested, at the core of this album is Santos' arrangements and guitar performance. Your natural expectation then is that the songs, the compositions in their fundamental form, are simply platforms for some tricky and bristling solos. That may be true, but it's also too much a reductionist thought. Santos writes songs, surely for himself and his guitar, but also for the essence of a song, an accessible and entertaining listening experience. Some of this comes from his keen sense of melody, another from Mancini's harmonious vocals and coherent lyrics. Good examples come within bristling heaviness of Judgement Day and The Patriot, but also with the dense anthem My Dark Serenade. That aforementioned heaviness, notably in the riffage, is definitely a theme across the entire album. The undercurrent of melody or the vocal harmonies may seem the twist or even a foil to this element. Or perhaps it's merely a sweet and subtle juxtaposition that blends well together. I thought so on the title cut, Thirteen Revolution, or Dissconnected, all of which breathe with heaviness, but turn also on hooks in the vocal arrangements. Sometimes, though, the heaviness prevails and almost seems directionless as with Carols Wonder, a song that doesn't have a 'foil' to the heaviness. However, that may come in the late third when the refrain seems stronger. It's still not a bad song. Admist all this you have Wish You Well Tonight. With it's vocals, acoustic guitar, and symphonic notes, it's in diverse contrast to the rest of the album. Of final interest, or not, there was something interesting about Mancini's voice. He has a clear and focused style, slyly raspy. But often his timbre reminded me of Eddie Money. Remember him? All in all, Worlds Entwined is a genuinely interesting listen, and definitely worth your interest, especially if you like your melodic hard rock a bit heavier. Worlds Entwined is a genuinely interesting listen, and definitely worth your interest, especially if you like your melodic hard rock a bit heavier.